Buying Guide: Which iPad should you buy? So you've decided to buy an Apple iPad - either for yourself or as a Christmas present for someone else (lucky them!). But should you get the Wi-Fi iPad or 3G iPad, and how much storage space do you need on it? Equally importantly: do you want the white or black iPad? Apple only sells the iPad 2 new, though the original model may still be available through its Refurbished Store (see more below) or through other retailers. In terms of the colour, it's purely a matter of taste. If you've already got a black iPhone or iPod touch, do you want the iPad to match it? Or have you fallen in love with the white iPad? The choice is entirely yours - they cost exactly the same. Our iPad 2 video review is below. 3G iPad or Wi-Fi iPad? Having decided on the colour, you come to the important decision of whether to go for the 3G iPad or stick with the cheaper Wi-Fi-only iPad. To help choose, think about where you're going to be using the iPad. If you're just planning to use it in places you've got Wi-Fi internet access - around the house, at college, university or your workplace - you're fine with the Wi-Fi-only model. Similarly, if you've got an internet-ready smartphone that allows you to share its web connection (known as tethering, or Personal Hotspot), you'll be able to get your iPad online this way. Speak to your phone's network provider about whether your contract allows tethering and what it costs. Another option to get your Wi-Fi-only iPad online anywhere is a MiFi modem, which connects to a mobile network and creates a mini Wi-Fi hotspot, to which you can connect your iPad. It means you have to carry around another bit of kit, but you can connect several devices to it at once, so it's a good way to get both your iPad and laptop online at once, for example. The 3G iPad may be the better option for you if you want to get your iPad online almost anywhere without having to rely on tethering or a MiFi. It'll let you get on the web wherever there's mobile signal, and doesn't even necessarily require you to sign up to a lengthy contract. When you buy a 3G iPad 2 from Apple, you're offered the choice of Vodafone, Three, Orange and O2. There's a huge array of plans you can get, from one-off daily access, through to two-year contracts. Which you get depends on how often you're going to be using it, and what for. In general, 1GB a month should be plenty for email, web browsing and a small amount of music and video. We like the rolling monthly plans offered by Three and O2. At the time of writing, Three gives you 1GB for £7.50 a month, while O2 gives you 1GB of mobile data plus unlimited use of BT Openzone and The Cloud Wi-Fi hotspots across the UK for £10.21 a month. If you're planning to use a lot of data, Three offers 10GB for £15 a month. Orange has a plan with a similar allowance plus 10GB of BT Openzone Wi-Fi usage for £25 a month. The next decision to make is how much storage do you want on your iPad. It comes in 16GB, 32GB and 64GB models, and your choice now is important, since there's no way to add more capacity to the iPad later. The 16GB model is likely to be enough if you plan to use your iPad primarily for web browsing, email and watching internet video via BBC iPlayer, YouTube and so on. But if you (or the lucky recipient) want to watch lots of films and TV shows while you're on the move, you'll need to store these on the iPad itself - and they take up a fair bit of room, so it's worth paying extra for one of the higher-capacity models. Similarly, popular games like FIFA 12, Real Racing 2 HD and Infinity Blade require a fair bit of space, so if it's being bought as a gaming device, consider a 32GB or 64GB iPad. A quick look at Apple's Refurb Store may show up some cut-price deals on both the iPad and iPad 2, some offering almost a third off the original price. Refurbished products bought from Apple have been pre-owned and returned, possibly because of technical problems. These issues are fixed and the iPad is put through a thorough testing process to ensure it's working correctly, before being sold with a one-year warranty. The downside is that these products could have "minor cosmetic imperfection", such as scratches or marks. For more about Apple's refurbished products, see the FAQ. It's possible to find fantastic deals on second-hand iPads and iPad 2s on sites such as eBay. If you do, make sure you see pictures of the actual iPad you'll be getting and ask the seller to tell you exactly what condition it's in: for example, are there any dents or scratches on it? Is the headphone jack damaged? If it's being sold off very cheaply, ask why. This way, you know precisely what you're getting. And make sure you buy from reputable sellers: check out their feedback before you buy. Once you've got your iPad, you'll want some apps, games and accessories for it! Be sure to check out Tap! The iPhone and iPad magazine from the same publishers as TechRadar. 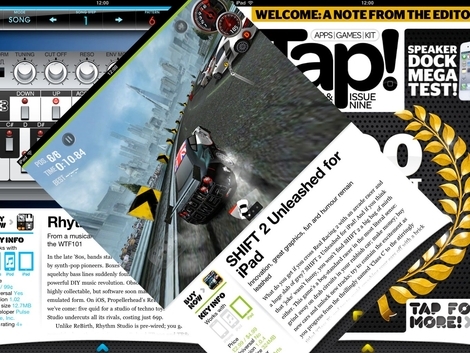 Out every month, it's packed full of app, game and kit reviews, tutorials and more. As well as print and Zinio editions, you can also get the exciting new app edition, built from the group up exclusively for iPad, and packed with fun stuff to do.